In the townships of Johannesburg, South Africa, about 80,000 people live without access to sanitation, electricity or running water. Most of the residents are children. Affected by these appalling living conditions, Maurice Strijp, Dutch owner of a large South African hotel, created the Ukajede Foundation. Eric Craft and his family visited South Africa in 2009 and 2014. 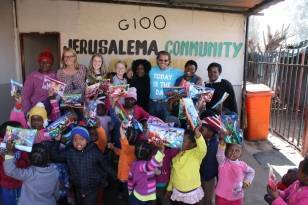 During their first trip they encountered the townships and learned about the Ukajede Foundation. Eric: “The situation in the slums affected our family so deeply that we decided to support the Ukajede Foundation. We had the pleasure of meeting Maurice Strijp and found him to be a very committed and honourable person. Salon Craft has adopted the nursery school Jerusalem. We hope that our clients and associates are inspired by our story and consider a donation to the Ukajede Foundation. For more information and details about Salon Craft’s role in the project, visit: www.ukajede.co.za.